GFRG (Glass Fiber Reinforced Gypsum) is the interior alternative to GFRC (Glass Fiber Reinforced Concrete) and sometimes abbreviated as GRG, or GRC. GFRC is used for exterior projects as it is similar to concrete in strength and durability with only a fraction of the weight. GFRG is a reinforced gypsum product having high strength with lighter weight for interior projects. Glass Fiber Reinforced Gypsum (GFRG) consists of high strength resistant glass fibers bonded with high density gypsum cement to produce panels that traditionally were done with plaster castings. The GFRG is lighter in weight, superior in strength and much easier to install than the traditional plaster castings. GFRG is lighter than traditional gypsum and can be formed to a better detail. 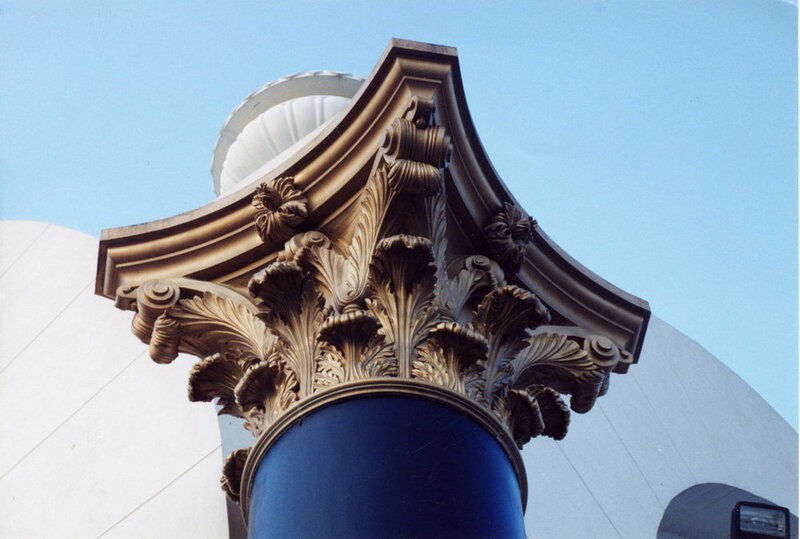 There are hundreds of in stock molds available for column covers (straight/tapered/fluted), capitals, bases, moldings, baseboards, coves and sconces, ceiling vaults, and cornices. These products serve both “functionality” along with aesthetically pleasing and innovative design. custom mold being removed. Contact Design Strategies (888-692-7377) for more information. GFRG can also be used for wide range of entry way and door surrounds. GFRG can also be used medallions, intricate moldings and decorative pieces to dress up the ceilings and walls. It is often used to replicate historical interiors found in hotels and restaurants and period homes or where ornamentation is a significant part of the overall look of the property. The savings arise since GFRG is made in a factory setting at not at the job site. The molds are designed to create shapes and integrated supports that enhance the overall look and design of a room. It requires minimal structural support when installing the panels making the installation process simpler and cost effective. The panels can be formed in to complex shapes expanding its usage significantly. The panels can be made in extra-large sizes. Plaster is normally cast in place at the job site, where as GFRG products are pre-made. All you need on the job site is installation. This makes deployment of GFRG products much simpler. Given its production process, the panels can be colored to match any aesthetic on any project. GFRG requires little maintenance and, due to its strength it is resistant to high impacts. Due to the lightness of the material, shipping costs are minimized. GFRG can address any design intent specified at a lower cost than traditional materials. To learn more about GFRG, GFRC, FRP, or other molded products, reach out to Design Strategies today. We work with the longest standing plaster shop in the United States, and are the foremost experts in using this material for commercial architectural applications. Newer PostWhat is PVD (Physical Vapor Deposition)? Older PostWhat is NRC, STC, and SAA?